Pirate ebooks. 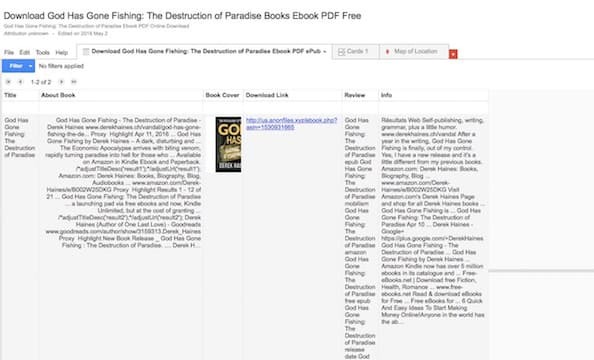 Have your books or ebooks been pirated? 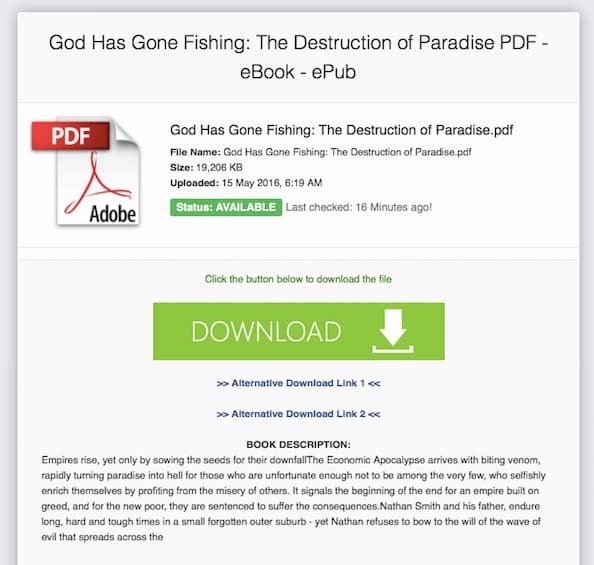 When I released my last book, God Has Gone Fishing, I made sure not to list my new title on Google Books, due to the problems of well-known book piracy on the site. Almost every book I have ever published has been pirated, BitTorrented, copied in pdf or offered under another author’s name. In an earlier post, I wrote about the problems with rampant piracy on Google Books and Google Play and how Google has taken very little action to stop the fraudulent abuse of books, especially in the United States. But back to more recent events, and my new book, which took almost no time at all to be pirated. I did a quick Google search for my book title and found the following sites offering my ebook on the very first search web page. I didn’t bother looking any further. This was within only a few weeks of publishing my book. Please note that I have not added links to these sites, because I refuse to give these book pirates any traffic. On top of that, going to these sites can risk getting a computer virus. Yes, some of them can be very nasty. I make no claim to being a popular author, so I shudder to think of how many ebooks and books by popular authors are being pirated every single day. So, what can you do if your ebook is pirated? Absolutely nothing I’m afraid, apart from taking it on the chin, feeling grumpy for a while and then ignoring it. While most online retailers use DRM to protect their own ebook businesses, it only takes a minute or two to strip DRM from an ebook, including Amazon Kindle ebooks, and then for the pirates to be able to make a saleable copy in mobi, epub or pdf. So for these pirates, it’s all too easy to steal an author’s work. The problem is not restricted to ebooks either. Here is an example of one of my earlier paperback titles being offered by a pirate, which by the way, is still listed on Google Books, even though I lodged a takedown request with Google over two years ago. So, have your ebooks or books been pirated? If you’re not sure, perhaps it’s time you checked by doing a Google search. But then again, what’s the point, because there is nothing at all you can do about it. But ebook piracy is not all gloom and doom. On a positive note though, it is worth understanding that people who use peer-to-peer sharing or BitTorrent to access free ebooks are hard-nosed, addicted chasers and collectors of anything and everything that is free, so they are highly unlikely ever to pay for anything. In addition, file sharing sites are often infected with viruses and most modern web browsers now block these sites due to this risk. So yes, there are some who will take all these risks to get your ebook and download for free, but they will probably never read it because all they want to do is to fulfil their addictive thrill of collecting free stuff. It’s all rather pointless, isn’t it? Well, not really. I like dark clouds with silver linings, and for me in this case, it is that these pirates inadvertently give me a weird kind of book promotion. I get extra Google Search listings, name and title recognition and occasionally, perhaps even real ebook sales as a result. As most readers would never use or access file sharing sites for free books, they may see my name and title in a search result list on Google and then pop over to Amazon or Apple iBooks, out of curiosity. Any publicity, is good publicity, right? Further reading: Malware And Viruses – The Price You Pay For Free PDF Books? ← Can You Find All 27 Figure Of Speech Examples? It may be little comfort, but a lot of the sites purporting to offer free copies of paid books don’t actually have a copy of your book to begin with. Many which readily turn up in web searches either redirect the wannabe pirate to a legitimate subscription site like Playster, which doesn’t have your books to begin with, and collect an affiliate fee on signup, or fake subscription sites trying to look legitimate, which are happy to take the pirate’s credit card info and run with it despite having no copy of your book to provide either. It’s much harder and more dangerous to break into book piracy than it used to be, especially with Scribd being mostly reformed now. I don’t wish pirates any harm, but maybe some of the more casual ones who pirate only some of their reading and buy the rest, may get tired of the hassle and the risk and you’ll become one of their paid-for, must-read authors. I think you may be right, Dan. Whereas P2P used to be about simply getting stuff for free, it has now become more a scammer’s playground and is fraught with risks. 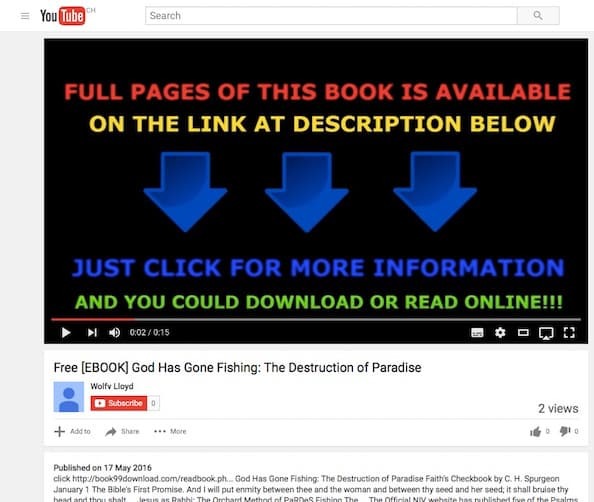 Another full-time but not highly ranked author here – just wanted to add that the new thing I’ve found that really makes me laugh is posting links to pirated books on Youtube. Youtube’s good about takedown requests (I had it removed within hours) but it was back up again less than a day later. On the upside, the site itself appears to be a phishing scheme, so I take small solace in hoping that whoever does pirate the book ends up with a nice little virus for their efforts. And you’re right–folks who are chasing pirated books online… they were never going to buy our books anyway. It’s not a lost paying customer. It’s someone who never would’ve bought it in the first place. Which is a silver lining, as you say. So glad I’m not the only one who’s come up with this conclusion. All of my books are pirated, and at first I used to go through the trouble of issuing takedown notices but foind it to be a waste of time and energy. However, I got one response from a piracy site that admitted they did not actually have my book file and it was a way to generate traffic to their site — so yes, sometimes it really IS free advertising. There is an entire culture of pirates that will do anything to get their entertainment for free (movies, music, games, books), and there is no stopping them. Best we take the silver lining, Helen! It’s publicity. It works well for us in removing illegal copies of our books online. For genre fiction, yes, pirated copies probably do not reduce sales because the downloader would not have bought the book. But what about potential textbooks? My next book could be assigned in college creative writing and playwriting classes, but if I publish a digital edition, I have little doubt that an instructor or a student would simply reproduce multiple copies (pdf or on some college photocopier). That piracy would certainly replace some sales. So I feel limited to producing a print edition (even then, of course, a single print copy could be photocopied for the whole class). I was a college professor, and saw rather a lot of well-intentioned photocopying by a few colleagues who were sympathetic about their students’ book budgets, including photocopying from “examination copies” provided free by the publisher to allow instructors to decide whether to assign the book. Why are ebooks pirated? Aside from the obvious here are a couple of major reasons. 1) If one buys a hard copy of a book one can lend it – many times over. Or, one could re-sell it and recover part of its cost. It sould be donated or simply displayed on one’s bookshelf. With an ebook that is difficult or impossible. So an ebook does not have near the value of a hard copy. 2) Hard copies of books require expensive paper, printing, binding, and storage facilities. Then it must be shipped vast distances to get it to the marketplace and freight is not cheap these days. Then the book must sit on a shelf requiring valuable retail space and may sit there for months, if not years. That space is costly and in most cases the retailer must employ a manager and sales people whose salaries form part of the cost of that book. Then some copies may never be sold which means that ths sopys that are sold must cover the cost for those who don’t sell. Then there is a disposal cost, because we don’t get to throw away things for nothing anymore. An E-book on the other hand requires none of that. So, since an e-book has considerably less value and can be produced and sold at a fraction of a hard copy how is it justified to sell the e-book at nearly the same price as the hard copy? That outrageous pricing is a huge incentive for people to download pirated copies. Publishers greed drives people to these sites. There are positive aspects to those pirate sites as well. Many people who download a pirated book would have never paid the full price to purchase the book in the first place. However, after reading one book some will want to read more by that author. Since many books are NOT available on p2p sites those people then will purchase that author’s other books from a retail site. Several years ago I picked up an Ian Rankin book from a discount bin for $2.99 and since went on to purchase all of his other books. But without that first cheap book I would never have spent several hundred dollars on his other books. Furthermore, if an authors book has been pirated that usually indicates that it is a popular book and pirated downloads provides a wider circulation which results in more exposure for the book and the author. Since the vast majority of people do not download pirated ebooks, that added exposure will help the author become better known and promote the sale of more books. One might also take issue with the use of the word ‘pirated’ when one refers to the peer-to-peer file sharing of books. Are those peer-to-peer sites not very similar to what we used to call public libraries? So true. Why would you pay a price that is almost as expensive as a physical hardcover for a digital ebook? It just doesn’t makes any sense. If authors or publishers wants to get rid of piracy, they should lower the ebook price. Just look at Steam and how it almpst eliminated piracy. Steam did not almost eliminate piracy by making products cheaper, Mr. Price. They made it technically impossible or difficult to make pirated copies. Eric, I for one am not bothered much by one reader pirating a book in order to read it. Much more worrisome is one thief downloading the book in order to upload it to sell it, or offer free downloads as bait to a malicious site, or selling it after changing the title, or facilitating piracy by a lot of other readers. Your reasoning that a stolen book might interest the thief in buying a second book by the same author — would you excuse a bookstore hard-copy theft on the same grounds? I hope not! You are correct that a printed book costs more to produce than a digital copy — but not by much. Printed or digital, all books have certain costs: the author’s time, hired copy editing, book design, cover design, page layout, ISBN registration, maybe indexing, maybe rights to use illustrations, and probably the costs of a website, marketing, and advertising. If you look online for a book printing quote, you’ll find that a paperback (whose page count and size match $15 books in a store) can cost $2-$3 for as few as 250 copies. A pirate site taking and offering your book to others for free isn’t at all the same as your book being offered in a public library. Here’s why. A library pays your publisher for the ebook copy they offer, so you as the author are able to earn a little bit in royalties for that sale. And the publisher who supported you also benefits. Plus, bonus, the reader gets to borrow the copy legitimately and doesn’t have to worry about a device getting messed up by malware. For any book pirates out there reading this :), I just want to leave you with one final thought. If you take a book from a pirate site, please keep in mind that the books are there without the author’s permission. If you take, read, and enjoy, then also give back to honor the many hours of love, dedication, and hard work the author poured into their creation to bring it to you. Give back in support of the author by purchasing a copy or requesting that your local library purchase it for their collection, and leaving a review on Amazon and Goodreads. Since I discovered that two of my e-books have been pirated I kept reporting them to Google and other reporting sites and managed to have the sites removed. Of course sooner or later they reappear in the search pages, in lesser number though, or in You tube who is very good at removing them. I believe that if all authors who have their books pirated would keep reporting to Google in the end they would stop pirating because pirates are few and authors are many. As they say union makes strength. Perhaps misery loves company. The comments on this discussion seem to combine acceptance of book piracy with some impressive tales of determination with minimum results. My pet peeve tonight is that Google makes you fill out different forms for YouTube violations and Google search engine results. Why? It just seems like one more annoying aspect of a bizarre, frustrating situation. BTW, if I had only received two dollars for each of these thousands of illegal downloads of my ESL conversation books, my bank account would be far healthier. Live and learn. We share a common pursuit, Eric. I made most of my ESL materials free on my own website, hoping to at least earn a little in advertising revenue. It was a cunning plan, that didn’t work at all. For what it’s worth I have been using Blasty to get rid of sites illegally selling my books. There have been a number of reports as to if this site is a scam or not. At present time it appears ok but time will tell if it is or not.